Sages of yore have given such great insights into our body, mind, intellect and prana that paves way for an aspirant to have deeper understanding and in-depth exploration of one’s own self. This video features the answer given by the revered master Anandmurti Gurumaa in response to the question by a seeker about anandamaya koshah. 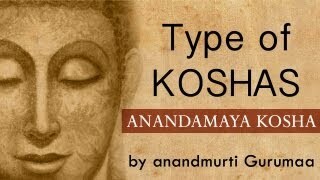 It has been explained what koshah means and how five koshahs encase Atman, the true self. They are named annamaya koshah, pranamaya koshah, manomaya koshah, vigyanamaya koshah and anandamaya koshah. It is amazing to become aware of these layers of koshahs and how the real self is separate from them. Know more about it in this talk. How is this body formed?